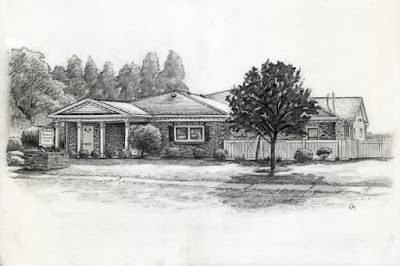 Very quickly in the midst of finishing up the color guides and begining work on my new and very exciting project, I was commissioned to do a drawing of the Veterinary Clinic where my sister, Amber, works as a Christmas gift to the owners. It's been a long time since I was asked to do a simple black and white drawing, but it felt pretty good to be able to take a day and do it. Now on to an intense, terrifying, and exciting next two months. Eep! I've been enjoying myself creating the pencil drawings and color guides for children's paintable sets produced by Red Farm Studio. 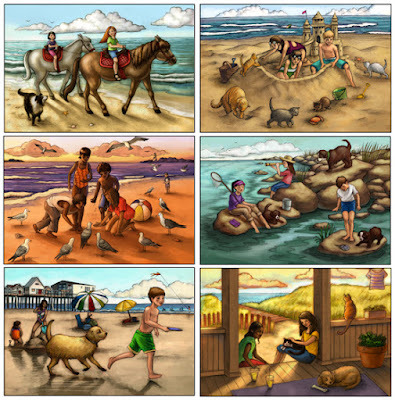 I was hired to create this "Beach Buddies" series about kids and animals at the beach. It was quite fun to do and hopefully someday I'll get to do some more--maybe even exclusively animals! In addition to that, I was also hired to do the coloring of another artists drawings, a Seabirds series and a Four Seasons series. I've never before colored someone else's work but I must say it was kind of fun! Strange that I can get paid to do work that I did as a kid with a coloring book and crayons-- only with a computer and drawing tablet!